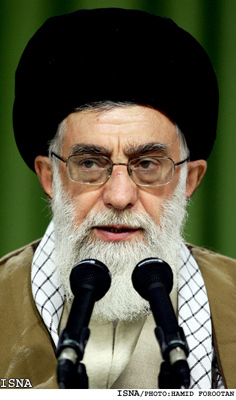 Tehran, Feb 19, IRNA - Supreme Leader of the Islamic Revolution Ayatollah Seyed Ali Khamenei on Monday called for speeding up the privatization program as envisaged by the Article 44 of the Constitution. In a meeting with officials from the executive branch of the government, the Supreme Leader said that implementation of the directives on the privatization program had not gone ahead at a satisfactory speed. "The directives on privatization program communicated to the three branches of government on May 22, 2005 and July 2, 2006 were not implemented quickly enough to take effect. It is expected that implementation of the privatization program envisaged by the Constitutional Article 44 would make a breakthrough in the financial well-being of every individual," the Supreme Leader said. Ayatollah Khamenei said that the Constitution of the Islamic Republic calls for a economic balance among the private, cooperatives and public sectors. "In the first 10 years after victory of the Islamic Revolution, the Iraqi-imposed war (1980-1988) forced the then officials to control the economy, so the public sector developed without a balance with the private and the cooperatives sectors. Unfortunately, major steps have not been taken to strike a balance among the three sectors. So, the public sector developed further and the current situation in the economy is not satisfactory," the Supreme Leader said. Ayatollah Khamenei called on officials of the three branches of government to reach a consensus on the need for carrying out the privatization program and said that the low pace of the privatization program is because of differences of views among the government organs. The Supreme Leader made it clear that all the policy making in the economic sector should be in line with the Article 44 of the Constitution and the respective directives. 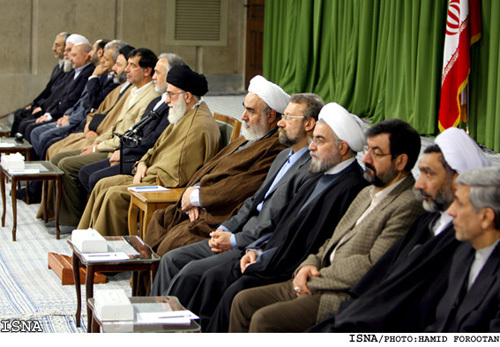 Ayatollah Khamenei said that the economic development is currently lagging behind the political and social development. "Of course, some works have been done, but, we should increase the per capita income and gross national product (GNP) by dealing with deprivation and poverty and administering justice. 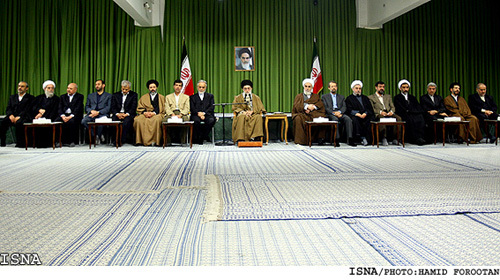 We should present a pattern for a successful economy and economic boom," the Supreme Leader said. 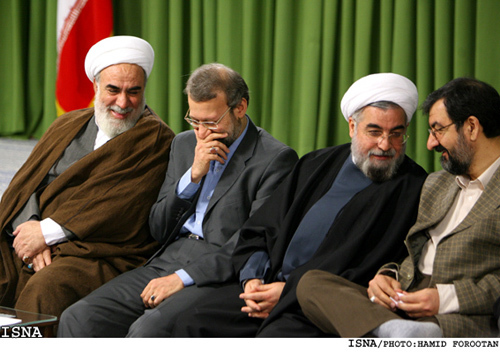 Ayatollah Khamenei recommended officials to work for increasing national wealth and administering social justice, adding that any program without the aim of increasing the national wealth is not useful. Elsewhere in his remarks, the Supreme Leader said that the government should only get involved in investment in fundamental projects and the people should be given opportunities to go ahead with investment projects privately. The Supreme Leader supported giving the 'Justice Shares' to the poor by the incumbent government and said that the economy should be ceded to the private and cooperative sectors as envisaged by the Constitution. The Supreme Leader also reaffirmed support for the campaign against economic corruption and called on the government, Majlis and the Judiciary to work together for this purpose.